King of England from 1483 to 1485 who had to deal with two rebellions during his reign. 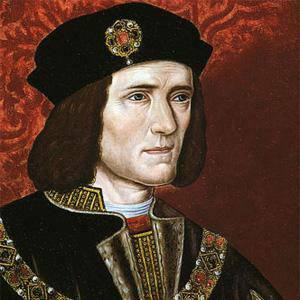 He died in battle during the second rebellion and he is the subject of the play Richard III by William Shakespeare. His remains were lost for nearly five centuries until they were found during a 2012 archaeological excavation. He received knightly training at the Warwick Middleham estate. He was crowned the King of England after his brother's children were deemed illegitimate. His parents were Richard Plantagenet, Duke of York and Cecily Neville, Duchess of York. He was succeeded by Henry VII.